Track again. Not cold this time so no icy patches to negotiate. The session was (6 x) 100 slow, 800 tempo, 100 slow, 300 fast. As usual I let poor Rick do all the work and just stuck with the group. I found this session comfortable until the last 2 sets although even then I wasn’t too knackered. I suppose I should really be putting more effort in to a track session but at the moment is more about just doing whatever I feel like on the day. It must surely still have done me some good. 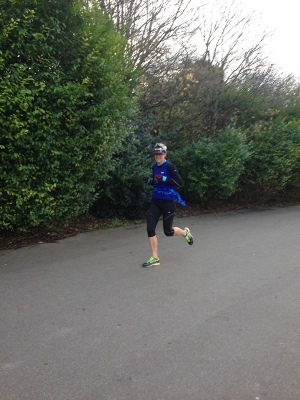 On Wednesday I intended to do a LSR but I wasn’t particularly feeling like it so I curtailed it to a 9 miler. 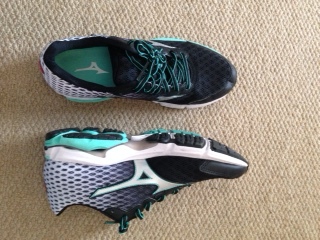 Also I was testing out my new Mizuno Wave Rider 18s. They passed. This run felt faster than long run speed. Whether it actually was or not we shall never know. For once it was only mildly windy and quite balmy so I just accepted I wasn’t going to do a long one and added my 9 to the bank. 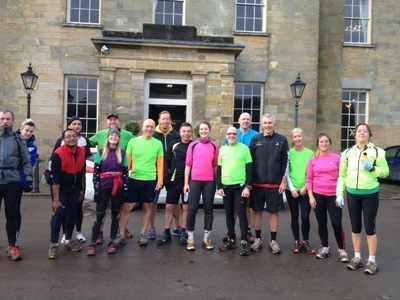 Having failed to do a LSR on Wednesday I arranged to go running with Danny on Friday. Unfortunately, even though we were doing what we usually do and the weather was actually slightly less windy and milder than recent times, we both found it ridiculously hard. We moaned our way round the whole run, Rick would have been proud. This was the worst run I have done since the Bluebell 10k and I think it is possibly in my top 3 worst runs of all time. On paper though it looks good – 13.5 miles at 8.20 pace for the 8 or so miles with Danny – so let’s just leave it at that. 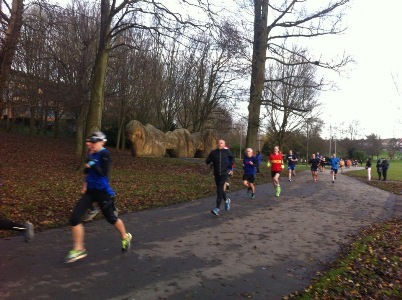 On Saturday it was the annual Arena Hove Park Superseries-finale Age Graded parkrun. The Arena crew pre-run. No Muffin photo-bomb this year. This race shall never be one where I can achieve anything such is the greatness of such runners as Chris, Caroline and Paul. To get anywhere near their approx 90% age grading I would need to run around 16 minutes for the 5k. I wouldn’t even be at 4k in that time these days. So my aim for the run was to well, just run. So I did. I was surprised to finish in 21.11, two seconds faster than last week when I didn’t feel I was trying as hard as last week. Of course this time is still miles off where I should be and was way down the list in terms of Age Grading but it will have to do for now. Sunday meant a muddy loop of Stanmer Park and woods. My Speedcross finally got to have a go on the surface they were designed for. Luckily Trevor had miscalculated how long the run would be so it was a very pleasant, short, slow and easy-paced 6 miles. I didn’t even mind the first mile or so of uphill. I think this was the flipside of Friday’s truly awful run as I usually detest cross country and hills. Perhaps it’s because I usually only do off road in a race setting and today was purely for the social side. Anyway it was a thoroughly enjoyable run. I finished of my Sunday with a climb with Lydia at Boulder Brighton. I did a 4A (I think that’s what it was) which is the best I’ve managed. The new pink and black holds are very rough so I got sore palms so I expect some excellent calluses to develop soon to complement my natural femininity. I smashed the yellow duck of doom though on my third attempt so **** YOU DUCK! A pretty paltry 39 miles for the week but after last week’s 3 x 13+ LSRs I think it is acceptable. 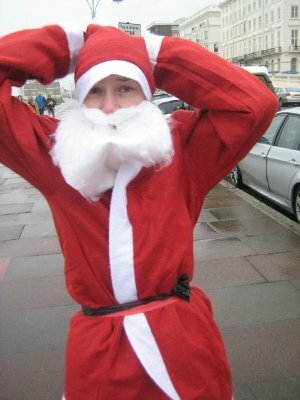 As I shan’t be back until after Christmas here is a splendid photo of me pre Santa Dash 2007 as a splendid Christmas gift. Hang on… I’ve been running for 7 YEARS!? How did that happen?